This illustration shows how X-rays were used to study why van Gogh paintings are losing their shine. 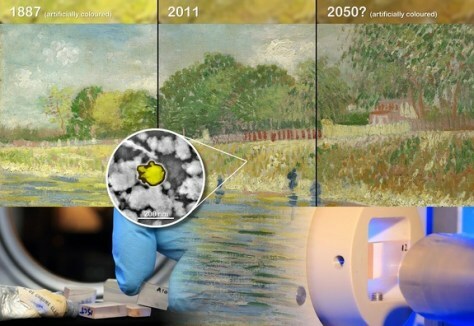 Top: a photo of the painting "Banks of the Seine" on display at the Van Gogh Museum, divided in three and artificially colored to simulate a possible state in 1887 and 2050. Bottom left: microscopic samples from art masterpieces molded in Plexiglas blocks. The tube with yellow chrome paint is from the personal collection of M. Cotte. Bottom right: X-ray microscope set-up at the ESRF with a sample block ready for a scan. Center: an image made using a high-resolution, analytical electron microscope to show affected pigment grains from the van Gogh painting, and how the color at their surface has changed due to reduction of chromium. The scale bar indicates the size of these pigments.